We hope you are all enjoying your tennis now that the summer weather has arrived. The turnout for recent events and club sessions certainly suggests we are! In light of the warm weather and the summer now being fully underway we have a new offer we wanted to make every member aware of. Please note the discount only applies to a new member i.e someone who was not a member of the club in either of the past two years. We’d also like to say a thank you to all members who have now renewed their memberships for the 2018/19 year, for those who have not yet renewed then please do this as soon as possible. Following the success of our Australian Open event in January, we are pleased to say we are holding a French Open themed fun doubles tournament and social on Saturday 9th June at 1pm. We will draw partners on the day. All members, friends and family are welcome so please spread the word and come along. There will be some french themed refreshments and a BBQ available on the day for you to throw your meat on! See you there, merci. It was fantastic to see such a great turnout for our annual Richard Edwards Memorial Tournament, which was played in the scorching Staffordshire Moorlands weather! Good fun was had by all and congratulations to the winners on the day; Ian Sales, Toby Gayes and Sam Chandler. We’re delighted to report that our Road To Wimbledon 2018 event was a great success played in beautiful May sunshine. Toby Gayes pictured below with Noah Eaton contested the boys final, with Toby coming out on top in a close match. Krista McCartney won the girls event who along with Toby will now compete at the regional stage of the competition at Wolverhampton in July. Well done to everyone who took part and good luck Toby and Krista in the next round! Have you seen our new club leaflets? Look out for our new club leaflets around the town this summer which are proudly sponsored by Povey’s Oatcakes! 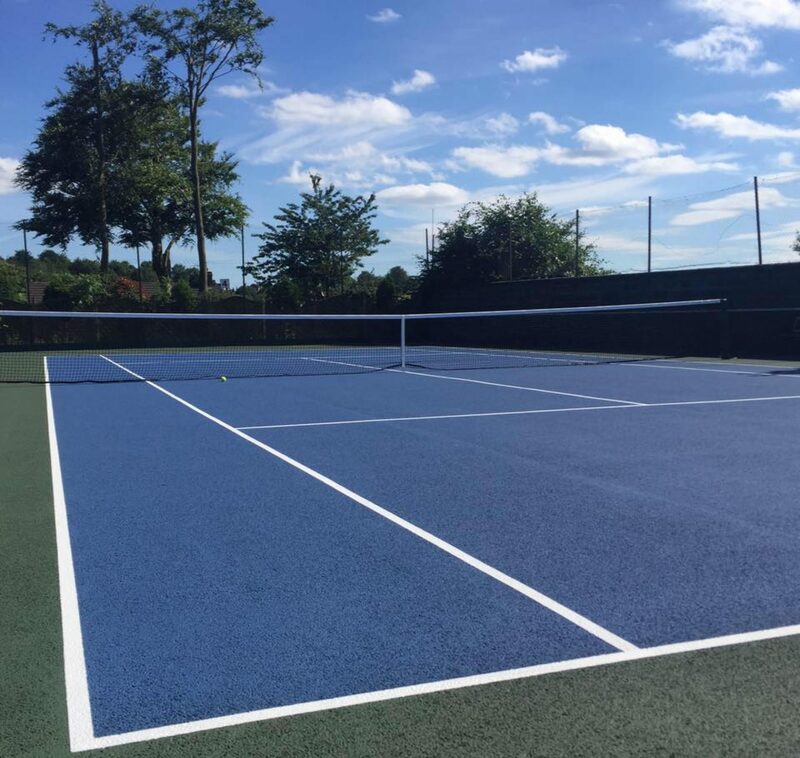 The leaflets provide details of everything on offer at the tennis club, including our summer holiday camps, the coaching programme, club tournaments and details of our club coach Shaun Murray. To get your hands on one please visit the clubhouse! The biggest junior tournament in British Tennis is happening at Leek Tennis Club on Saturday 5th May at 10am. The Road To Wimbledon is an All England Lawn Tennis Club event which began in 2002. It is supported by the LTA and all the local LTA offices in England along with British Tennis icon Tim Henman. Everyone at the club is delighted to be running the tournament again this year. So we want all our U14 Boys and Girls members signed up and registered to play this tournament for the opportunity to progress to the county/national finals and potentially play on the world famous grass courts at Wimbledon. All players will receive a special Road To Wimbledon certificate as well as player prizes and a medal for the winner(s). Thank you for your support and we look forward to seeing you on the day. Leek tennis club is delighted to announce they will be running an inaugural Girl Set Match event at the club on the 30th April from 1:30pm. The LTA sponsored format is aimed at encouraging more women to play tennis. The event will feature a Women only fun tournament and the chance for players of all abilities to get into or back into tennis. Anyone wishing to take part in the event should contact the club via email (leektennisclub@gmail.com) or Margaret Wilshaw on 07867 510651‭. The club are pleased to announce that the AGM and annual quiz will be held at Westwood Golf Club from 7:30pm on the 22nd March. All members are encouraged to attend the AGM as it is a great opportunity to make your voice heard about the club and its future. Anybody wishing to join the committee should contact David or Frank at leektennis club@gmail.com. The quiz to follow is open to all friends family supporters and members with a charge of £4 per team payable. The bar will also be available for drinks on the night! As Roger Federer collected his 20th grand slam title down under, Leek Tennis Club celebrated it’s own tournament champions. Sam Bostock and Frank Murray were winners of our first grand slam open tournament of 2018 at the weekend. Played in difficult windy conditions (unlike the sunshine of Melbourne!) the tournament was played in homeage to Australia’s major tennis event with a good turn-out and fun had by all. Watch out for news of the other grand slam tournaments coming up this year – all members and non-members welcome. Next up is the French Open in May, get the Croissants ready and some warmer weather hopefully! Ever wanted to go to Wimbledon? Or maybe to a Davis Cup Match? Or perhaps you want to play in LTA rated tournaments? Then sign up to be a British Tennis Member today for FREE! If your a member of this club you’ll be able to #OPTIN to the Wimbledon Ballot as well!